Does cold weather reduce arson? 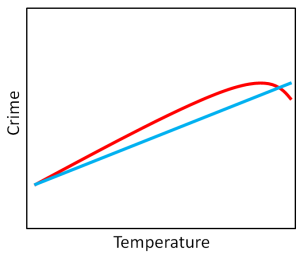 The blue line suggests a simple linear association where crime is roughly a function of temperature. The red line suggests that at extremely warm temperatures crime declines. There are several ideas that may explain both these patterns, including emotional responses to discomfort, and the routine activity of offenders and potential victims of crime. 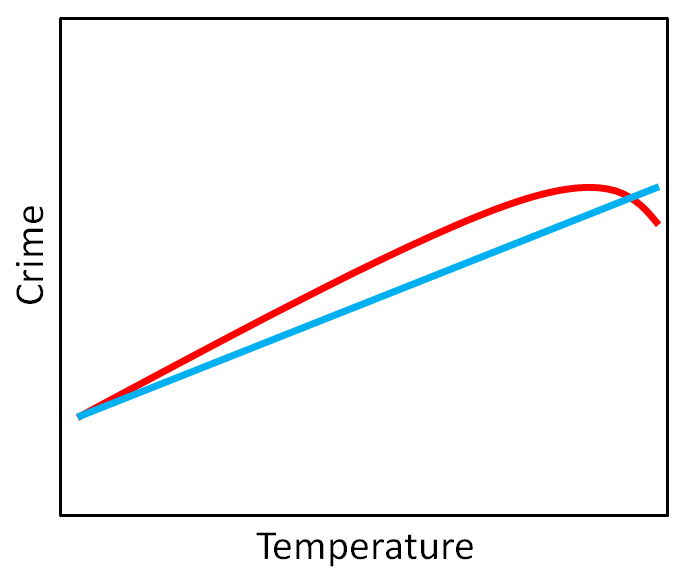 Our contribution was unique for several reasons, but primarily because our study area, Toronto, has more temperature variation than most settings studied to date–with both extremely hot and extremely cold periods. As temperatures warm there is more arson, but at extremely cold temperatures there is a considerable decline in arson, and at extremely hot temperatures there is also a decline, though at a smaller magnitude. Collectively, our results are most consistent with the theory that the temperature-arson relationship is probably due to changes in the routine activities of offenders. Whether motivated by fraud, violence or psychopathy, arsonists seem more active when temperatures are comfortable than when they are not; uncomfortable weather seems to dampen some of the motivation for committing arson. 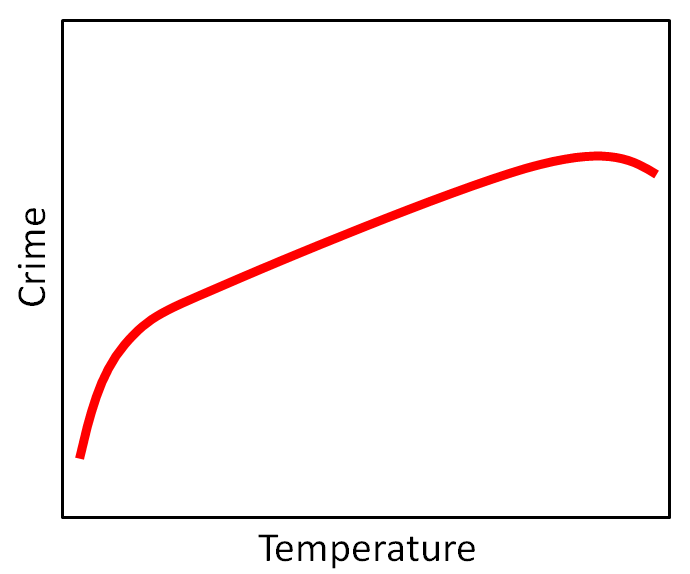 Furthermore, the coldest weather has a greater absolute effect on arson frequency than the warmest weather; arson is much less common on extremely cold days. More generally, our results show that the weather’s influence on the daily frequency of arson events is significant, and of a magnitude similar to things like Halloween, holiday weekends and hockey playoffs. This may also be important for understanding arsonist behaviour, and also improve the detection of serial arson behaviour. The better we understand the ‘baseline’ level of arson activity influenced by structural factors (like the weather and environment) the earlier we will recognize signals that depart from average, and may suggest serial arson activity. This entry was posted in Uncategorized on August 28, 2015 by Niko Yiannakoulias.